Both written & practical driving test are mandatory to get a Lithuanian driving license & an instructor or school is a prerequisite for the tests. 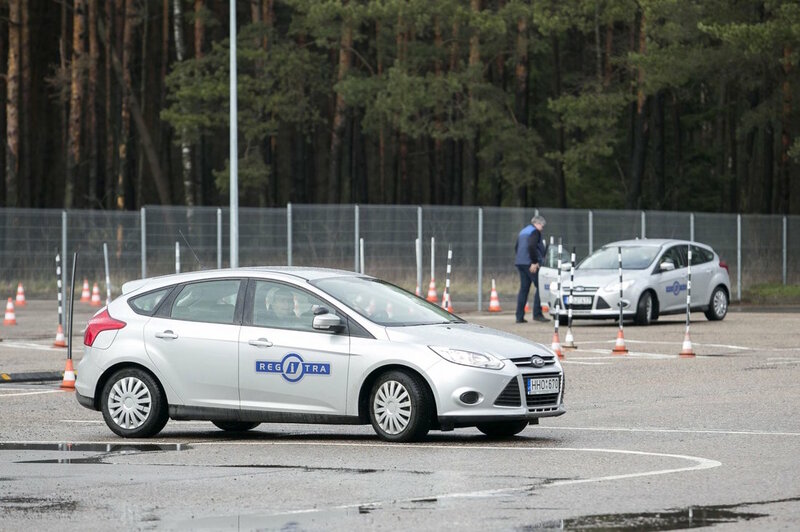 must pass a theory exam and a practical test held by the Lithuanian State Enterprise "Regitra"
There is no formal requirement for taught hours of driving theory, so this can either be learnt through self-study or through a driving school. Video about what you need to know when you arrive or stay in Lithuania, and what you must do to drive on the roads here. ​20 years. However, to drive motorcycles inthis category you must have a minimum of 2 years' experience on motorcycles under an A2 licence. This requirement may be waived if the candidate is at least 24 years old. You can take driving exam only if you permanently residing in the Republic of Lithuania (living for more than 6 months). Documentary proof of person’s identity. Valid medical certificate confirming your state of health and psycho-physiological abilities are fit for driving a motor vehicle of a particular category. Health attestation certificate confirming your graduation of courses in First Aid Training. Earlier issued valid driving license, if any. After that, you must take a first aid examination. A trained specialist usually comes to the driving school to teach first aid for a few hours. If you pass the first aid examination, you are supposed to be in a position to give first aid in case of accident! ​​The next step is going to the hospital and take medical examinations for the sight, check the presence of alcohol in your blood etc. In general, doctors check people's general health conditions. To get a driving licence​​ will cost you about 600-800 Eur including driving lessons and fees. ​Once everything's cleared up, you can go ahead with the driving lessons. People must take at least 20 hours driving lessons with a trained instructor. ​Once completed your theoretical test at the "Regitra" is completed successful, you can take driving lessons and your final driving examination. If you have a driver's license issued abroad, you just need to go to "Regitra" and exchange it for a Lithuanian driver's license if your country has signed a convention with Lithuania on driver's license exchange. ​Check your eligibility with the Lithuanian embassy in your home country. Exchange is possible provided that you are staying in Lithuania for more than 6 months. If you travel to Lithuania for a short period of time, you don't need to do anything. Driver's license from other countries are valid and accepted in the country. 3. If your docs are OK for Regitra train yourself with online tests for a small fee (f.e. www.ketbilietai.lt, but it is in LT only. Perhaps there are others with EN, because you are eligible to pass Regitra's theory tests in LT/EN/RU). Or you may complete driving courses and obtain certificate from Regitra but in this case you will be a 'rookie driver' in Lithuania with certain limitations like zero alcohol, speed limits, etc for two years. For professionals (categories C and D), the medical certificate is only valid for 2 years.